Hike for 3 days in Olympic National Park. This is the most popular kind of backpacking trip, since most hikers have time period available for an adventure. I will focus on the hikes that only require one trailhead; also known as an Out N Back. Don't forget about Olympic National Forest land! 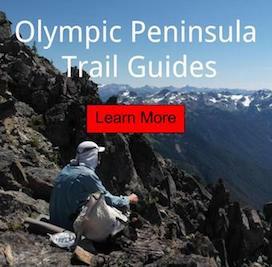 Backpacking on the peninsula can be done year around, if you know the conditions of that specific area. I suggest always checking with a ranger station for trail conditions, know the weather forecast and always plan for rain; no matter what time of year. The drive times to the trailhead can depend on what end of the peninsula you choose to visit. Minimum from Seattle or Portland can be 3 hours, but also can range up to 5 hours. You should consider this when planning the first nights camping location. A person can reflect on the Wilderness Campsite Map, but never use this for navigation purposes. Having the proper maps and knowing how to read it can make all the difference to your successful trip. Wilderness camping permits can be obtained at the Wilderness Information Center in Port Angeles or Lake Quinault. One can also 'self-register' at most popular trailheads if you do not plan to visit a quota area; marked as red tents (on the map mentioned above). I will not be listing any of the destinations inside those area, because they are already overused. Keep in mind that the self register permits are often not in the boxes at the trailhead. Its best not to take the risk and just get necessary documentation at a ranger station.